Parking at meters on the streets of Grand Rapids just got a little easier, especially if you don't keep a pile of change in the cup holder of your car. No change? No problem! A few weeks ago, I drove downtown to get a hair cut and pulled into a metered spot. I looked in my empty cup holder, searched the bottom of my purse, and then canvassed the floor of my car. Nothing. I decided to chance it and go inside anyway. An hour later, I was feeling pretty good when I left with my new do, but that feeling left pretty quickly as I saw the parking ticket on my windshield. That haircut cost me an additional $15, which is the penalty for not feeding the parking meter. "If only there was another way to park without change!" I thought. That time has finally come! Parkmobile North America, Inc. is offering its Pay by Phone parking service to Grand Rapids. To get started, visit parkmobile.us and sign up for an account. You'll need a credit card and your license plate number. Once you are registered, you can add multiple vehicles to that account. Park in a metered spot. Call the toll free number to start your meter. Return to your car and call the toll free number again to stop your meter. 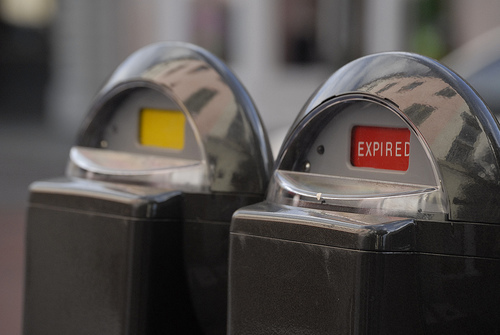 Each parking meter transaction will cost you 35 cents. That's pretty reasonable, considering that you can avoid over feeding the meter and stop risking the $15 penalty. For the first three months of your membership, the transaction fee is waived and you will get 30% off the parking meter price. A mobile phone app is also in the works, but no launch date has been announced. You can find the full press release on the City's website (.PDF).